Three years ago, Hurricane Katrina hit the Gulf Coast. People faced massive hardships and loss of property. While the media focused mainly on New Orleans, a sizeable region of our nation was hurting. Chaos and violence arose in various flooded and damaged neighborhoods. While our government was “getting its ducks in a row” to respond, many said it was too little, too late. It appeared to many news interviewees that the President and other officials did not have their priorities straight. 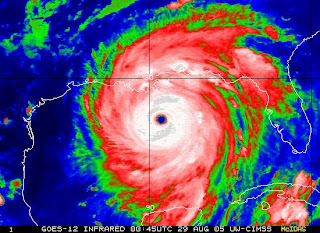 This week the Lord who stilled the storm on the Sea of Galilee permitted Hurricane Gustav to blow in from the Gulf. It fell short of the predicted strength, and damaged far less than expected. Yet the loss is still quite real, and the hurt still cries for healing. In apparent response to the criticisms from 2005, President Bush did not speak in person to his party’s convention this week. He remained in Washington, following surveying the hit region and meeting with disaster response coordinators. Even though his words and actions were for the good of all when Katrina hit, with Gustav the President has been sure to send a clear message that his priorities are straight. The Lord demands that our priorities are straight, as well. “You shall have no other gods,” He commands. This statement begins His Ten Commandments, with the others flowing from it. If we truly could keep this mandate, we would be able to keep all of His Law. All would be well, as we earned God’s favor, keeping Him as our Top Priority. How well do we do? Not well at all. In fact, we are miserable at having no other gods. The Lord is NOT our top priority, no matter how hard we try. For several millennia, since the serpent seduced Eve and her husband, the Lord has not been the top priority – we make ourselves our top priorities! And as Saint James reminds us, “For whoever keeps the whole law but fails in one point has become accountable for all of it.” (James 2:10) With our failure of priorities, we have failed completely. Yet the Lord reminds you today: your priorities do not save you! In fact, He tells you that you are His priority! Our loving Savior displays the ultimate in love and mercy as He gives everything for you, suffering and dying in your place. You are His priority as He places His name upon you in Holy Baptism, and frees you in Holy Absolution. You are His priority as He places salvation in your ears with His preaching and in your mouth with His Holy Supper. Yes, you are Jesus’ priority, as he brings you forgiveness, life, and salvation. The storms of this life will come and go. And the love and mercy we are gifted to show others during these hard times are a blessing. Thanks be to God; He does this all for you!